Over these past several months that I have been home from college, I have been pretty active in town. I have continued to attend the Great Oak Park meetings and continue to talk with the Mayor and Council about my now five and a half year quest for a dog park in town. I’ve attended almost all of the council meetings since May and have seen the array of issues, projects, and debates that have occurred in council chambers. Yet, there is one piece of news that has been overshadowed by flood buyouts, the Van Allen House and Stream House work currently underway, and the Bi-County property: sewers in downtown Oakland. Its not the most pleasant topic to talk about and if you plan on eating dinner soon, you need not worry about stopping this read, but thanks to the push over recent years by Oakland mayors and councils, it appears that sewers in Oakland could actually become a reality within the next decade. In speaking with the Mayor several weeks ago, she thinks it could even happen within the next few years. In that same conversation however, we wound up discussing another critical Oakland central topic that just doesn’t seem to go away: traffic. Now as usual, summer is not the time to bring this issue up as school is out, families are on vacation, and everyone’s schedule is just a smidgeon off. But once Labor Day comes, you better believe that we’ll all go back to complaining and bemoaning driving through the center of town. The Borough of Oakland has a lot on its plate already with library remodeling moving forward, decisions regarding flood buyouts coming up again in the future, continuing discussions on open spaces, new town parks, and historical buildings, just to name a few. But I would like to ask my fellow Oaklanders to do me a favor while I’m gone and start a new major discussion. In speaking to the Mayor in that same rolling conversation, we agreed that traffic in town has no simple solution. There are many things the town cannot do because of different laws or because certain roads are not really the Borough’s, but instead have county or state authority. While the synchronization of the traffic lights was a good idea, it only seems to have a noticeable effect when traffic is not going to or leaving schools and when rush hour has ended- hardly the cure-all to the town’s traffic woes. A few years ago, I clearly remember hearing at a town council meeting that Route 202 could be studied and using those results, the road could be restriped to better suit Oakland’s traffic needs. I’m not exactly sure what happened to that sensible idea, but the Mayor said that traffic would most likely be addressed once sewers come to town because when roads are ripped up, they will need to be resurfaced, and then of course, painted with lines. Waiting until sewers come will be painful for us Oakland traffic-plagued citizens, but it makes the most sense economic wise. Why do all the work now to have it destroyed by necessary downtown progress? Yet, as I’ve found out the hard way in my efforts to get a dog park in town, to get anything done in government takes time and plenty of patience. It is with this knowledge that I want to start a discussion NOW on how traffic downtown could be alleviated. That way, once sewers do come to town, the citizens and the Borough of Oakland can be in agreement of what we all want to aim for in our chance to not just sewer downtown making it friendly for business, but also traffic friendly for residents and people in this area who use Route 202 every single day. Before I lay out the “Schwertfeger Solution” (it sounds catchy doesn’t it? ), I want to inform you of a few important points. One: I want you to know that I am not a transportation expert nor am I an engineer of any sort. Two: there may be laws I’m not aware of that could make any of these ideas impossible to complete, but a discussion needs to start somewhere. Three: A part of this plan, proposal, discussion starter, whatever you want to call it, has nothing to do with the actual roads and striping, but our schools. They will need to be involved as well. And Four: Taxes may have to go up slightly and/or a higher authority (County or State government) may need to help out since some of the major roads through town are not the Borough’s. Now that I’ve said all of that, here is my proposal for how downtown traffic can be improved. 1. Create a downtown bypass road that can actually be implemented. a. I took a look at the 2006 Oakland Downtown Plan and was astounded to think that the town believes (or believed) that they will be able to realign West Oakland Avenue with Yawpo Ave. That’s not going to happen. In fact, while the railroad crossing is annoying, the problem really is not the 202/West Oakland intersection, but really the 202/Yawpo intersection that has an issue (But back to that later). My solution, as seen in Image 1, is to have a bypass road that connects Oak Street and the 287 off/on-ramp by West Oakland Ave. I’ve heard that this exact idea is in existence somewhere as a paper road but I’d like to find out why its still a paper road and isn’t there now. Elm Street would connect to this new bypass and if possible, so would Terhune. A sign should also be placed off of 287 making sure motorists are aware that the bypass road is for local traffic only and that any downtown traffic would still need to take 202. This could be further enforced by possibly mandating that traffic on this bypass road going towards Oak Street could only make a right at the end of the road (going towards the Rec fields) so that the homeowners on Oak Street do not have a line of people in front of their homes trying to reach 202.
a. I believe the worst intersection of town is Yawpo Ave and Rt. 202. Mall traffic and school traffic trying to turn onto Yawpo all back up in the long left turn only lane that usually strands motorists on the railroad tracks. This is a danger that should have all residents concerned. In addition, locals coming from the Heights and Manito side of town, making that left from Franklin Ave onto Route 202, know that unless they are planning to turn onto Yawpo Ave, that driving in the left lane of traffic is pointless because nobody will let you in once you reach the area by Allerman Drive. This causes further traffic issues as a line of cars continually backs up at that intersection. I say get rid of the Yawpo/202 intersection and make it strictly an entrance/exit to the small strip mall located there and the Krausers mini-mart. 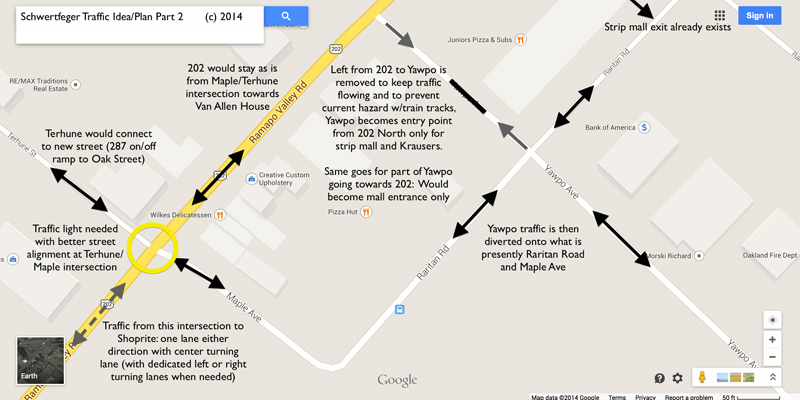 Instead, have traffic from Yawpo going down the hill towards 202 turn onto Raritan Road and then Maple Drive as seen in image 2. This will require road upgrades and probably a slight widening so that the buses have enough room to get in but I would think having a traffic light and a turn farther away from the railroad tracks would be safer and help traffic flow between Franklin and West Oakland on 202. If this is implemented, a traffic light would certainly be needed at this intersection of 202, Maple, and Terhune by Oakland Drugs. 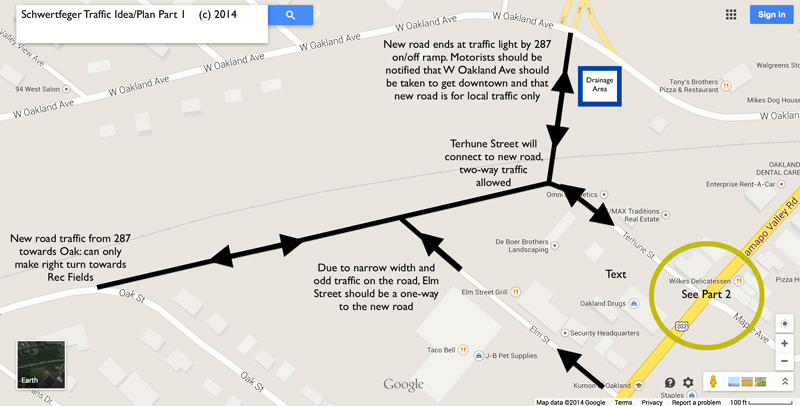 Lastly, Elm Street should officially be a one-way road (if it isn’t already) and while I did not indicate so in the image, I’m starting to think that if Terhune can connect to a bypass road, that Terhune should also be a one-way due to its narrow width. a. The worst traffic area is right in the downtown area between Oak Street and Franklin Ave. However, traffic can also back up on 202 in between Oak Street and Long Hill Road. From just observing traffic habits when I drive from one side of town to the other, it appears the biggest cause for traffic in between these two streets is when people try to turn left or right and because of a continual flow of traffic from the opposite direction, a long line of cars forms behind the car waiting to turn. I’ve been told that years ago, an idea was floated to make 202 an avenue, with two lanes of traffic in either direction. That is virtually impossible and would certainly ruin the character of town, as well as anger many homeowners. I would suggest that from the intersection of 202 by Long Hill Road all the way to Oak Street that a center turning lane be put in (which would most likely require the road to be slightly widened to accommodate the extra lane, but would certainly pale in comparison to adding a lane of traffic for both directions) so that cars wanting to turn can get out of the way of others wanting to make it to the other side of town. a. This is a very important part to solving traffic and this idea has already been recently discussed. The obvious problem is that the schools all let out around the same time sending cars straight onto Route 202 creating a traffic nightmare for motorists between 2:40pm and 3:15pm. So the solution would seem to just space out the school dismissal times significantly. But this would never happen because parents picking up their children find it helpful that the schools let out around the same time so they can pick up their kids in one round trip. That makes complete sense and I’m sure if I was a parent, I would feel the same exact way. It is obvious that some timing will have to change, whether it be start times or let out times, but the Board of Education, the Borough of Oakland, and the citizens of Oakland will need to have an in-depth discussion on what can be an acceptable change to the obviously failing status quo. Just like the Van Allen House and flooding are constantly a campaign issue that never seems to go away, it is time that traffic becomes an issue of decades past. Once sewers come into town, the Borough of Oakland needs to make the right moves that have the support of the community and these decisions need to be implemented quickly. Otherwise, development downtown will certainly occur in the blink of an eye, any open space remaining will disappear, and roads that have not yet been repaved will be paved, and an extreme opportunity will be missed on this issue that will hurt Oakland for decades to come. I ask that here in the comments section on this article, over Facebook, on Twitter, on online forums, and even in public settings that this topic be discussed and debated right now. I shall not and do not claim to have all the answers, nor can I waive a magic wand to make anything happen, but if I can help provide the spark that ignites an important flame that will help all Oaklanders, it would certainly be worth it. I think the idea of long-term planning for traffic in the downtown area is spot on and the discussions should be held now before the sewers come in so we can make whatever changes at the same time. Your ideas are good and yes, some have been discussed already but still worth exploring. One of them, the bypass road off 287, was thoroughly explored and deemed not possible. The reason is because it would require a 2nd railroad crossing and there are rules about distances between the crossings. One at RVR and a 2nd over by 287 are too close according to federal railroad standards. When you have freight trains that are over a mile long, you don’t want 2 crossings blocked at the same time. At least, that’s what the borough was told when this was considered back with the original downtown redevelopment plans. Staggering the school start and dismissal times actually already happens. People just don’t realize it. VMS students arrive at 8am while the younger schools arrive between 8:45 and 9am. Not sure on IHHS but I’d guess they are around the same time as VMS which adds to the traffic, So any change in schedules would have to include the RIH BOE too. Not insurmountable but another consideration. Perhaps a better option as voiced by others is to provide free busing to all the schools. This would drastically reduce the number of vehicles on the roads which would lessen the traffic during the morning and afternoon crush. These appear to be interesting ideas. Ironically, both Terhune and Elm used to run into a dirt road that ran into the curve onto Oak. Many of us used to walk and SLOWLY drive that back way to Oak and the rec field. Not sure when it was closed off with a dirt birm. Agree with that new extension. I do know that having been a (former) resident of a total of 40 years, knowing all of the back ways, I very rarely use 202/RVR as a way into or through town. Route to IHHS from Heights-Colonial RD to McCoy to Yawpo. West Oakland to Rec and up to 202/RVR on the otherside of the Fields, before the Walgreen’s strip mall on the corner created even MORE traffic congestion. Keith Ahearn: I had heard that about the railroad crossing issue as well. I’d like to find out how close the crossings are between 202 and Shelter Lane in addition to the railroad crossing distances in Hawthorne, as several cross streets go over a railroad line right off of Lafayette Ave, just to compare. Obviously learning more about what the railroad crossing rules and regulations are would be helpful and that would have to be investigated further. (If anyone reading this has any information or knowledge about what the rules are, please share!) I wonder if there’s any action the Borough Council could take to designate the area as a problem spot that could help the town get around certain regulations. I know the railroads are a very special entity so hopefully the federal government won’t have to get involved just to help get a crossing there. As for schools, someone on facebook also commented on the start times, and yes, those are staggered. (So you know, HS students are supposed to arrive in between 7:20 and 7:35am as the first class starts at 7:40) But the IHHS and VMS dismissal times are only a minute apart- hence, bad downtown traffic right before 3. The elementary schools don’t cause too much of a problem because they are off in residential areas and serve those specific areas. Busing may help, although I’m not sure how many parents would be interested, but as I wrote, one or two things may help, but many things will need to happen to really make a considerable difference. Barbara Smith: I’m with you all the way! I live in the same general area as you and when going to high school in the morning, I would never drive through downtown Oakland, instead driving through Franklin Lakes to get to IHHS. Had to leave town…Built my house in 1979, taxes $3000…by 2007 they were $24,000. Now in SC with same size house, taxes $2800…Hello, gas here $3.08…Live is good in the south…Don’t miss the traffic, only the Italian food and the Jersey Shore…fortunately we have a rental house at Barnegat Light and enjoy it off season.